In our 5 minutes with profiles, MEF members talk about their business, their aspirations for the future and the wider mobile industry. This week, Tom Horsey Founder & CEO introduces Crazy4media. 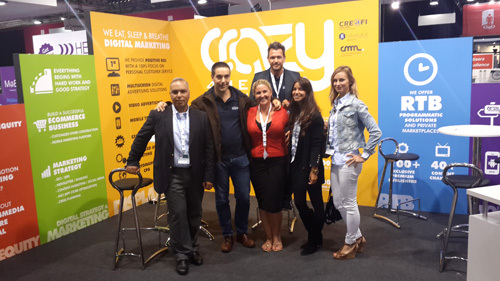 Crazy4Media is a group of four specialist digital media companies, comprising of C4M Online (dedicated to the monetization of online advertising inventory for publishers), C4M Mobile (specialized in mobile entertainment and billing solutions), C4M Marketing (Social Media & SEM experts, focusing on performance marketing campaigns for e-commerce clients), and C4M Software Labs (externalised software development for digital entertainment and advertising companies). The group was founded back in 2001 in Sevilla, Spain with a small team of experienced professionals and has since expanded worldwide with offices in London, Hong Kong, Malta, Mexico DF and Slovakia. Crazy4Media Mobile is focused on mobile entertainment and billing. After years of strong emphasis on technological innovation and the creation of premium content services within just a couple of geographies (Spain and South Africa) we are now looking to develop internationally, particularly into other African nations (we are already testing Nigeria and Kenya), followed by geographies in Latam (where we have operations in Colombia currently) and Asia. When did Crazy4Media launch and what growth have you seen? Crazy4Media Mobile originally started off as “Froggie Mobile Marketing Solutions” back in 2001. As a result we have lived through both the ringtone and the smartphone app booms, and gained phenomenal experience from both! After rebranding in 2014, to go in line with the Crazy4media group name, we have concentrated predominantly on D2C premium digital content services, although other third party companies still run some B2B aggregation services through our connections too. What are your main goals? Right now we are focused on growing our portfolio of premium content services, and launching them into Africa and Latam in collaboration with MNOs, using direct operator billing as the main user monetisation tool. Where do you see Crazy4Media in three years’ time? With significant operations in at least 15 geographies between sub-Saharan Africa and Latin America. What aspect of mobile is most exciting to you right now? We are very focused on direct operator/carrier billing and its use in cross platform content services, particularly those encompassing television and mobile. What’s the most critical issue that will hit mobile within the next 12 months? There is a strong focus on improving regulation in many geographies at the moment to better protect the end consumer at the same time as allowing companies to innovate effectively, which is particularly important in the context of the connection of ever more devices to internet, both in terms of IoT and the connection of ever more new users in the developing world. Apart from your own, which mobile companies are the ones to watch in the year ahead? In general right now the companies to watch are those that are making efficient use of mobiles to crowd source services, from Uber through to Instacart, Handy and even Washio. Right now most of these companies are just focused on the US market, but as they expand internationally, and incite local companies in the geographies that they expand into to create similar services, the changes they bring about will be dramatic. We are involved in a number of companies of this kind as mentors and shareholders, including those offering services such as online instant interpreting services and user experience reports.